Agnosticism comes from two Greek words. A is a negation or a void of something. Gnosticism is from the Greek ginosko or the Spanish conocer; that is to progressively know. The agnostic is one who is void of knowledge. We have things really confused in society. What is called progressive liberal thought is what Jesus is all about. Jesus should be embraced by progressives. The intentions of progressives are good, but their methods are wrong. Should the wealthier pay more if they have it? Jesus commands those who have, to be generous with those who don’t. Yet, He causes the wealthy to do this by His love and not from being over regulated and over taxed through big government. Excessive regulation is the perverted will of God in society which has rejected Him. God regulates us out of transformation of inward character where man naturally wants to do what is right through that transformation. Big government’s regulation is the attempt to do what God desired, but because man’s character is not transformed in holiness and love, the oppressive hand of big government tries to do it for him. The work of God’s grace in the wealthy motivates them to spontaneously and freely give. But when progressives want to over tax the rich and demean them when they flee from country, is not the will of God. God has not called the wealthy to be the door mats of the poor. If Christ was in the progressive’s culture instead of being alienated from it, it would see its dreams became reality. We would see social justice issues attain resolution through transformation of moral character, and with that chastity and abstinence, rather than promiscuity and abortion. The government of Jesus Christ is one of love. It is the government of free will through the still small voice of God, and not the coerced will through the big voice of government. I challenge progressive government to make Christ Jesus its loving Lord and see if all it desires does not come to pass. I am not talking here about Jeremiah Wright’s or social justice religion, but Biblical theology where God’s Word is exalted above all social justice issues. I’ll give you the solution to the financial cliff in five minutes on Face Book. From 1998 to 2012 revenues have increased 2.9 % annually. Spending over the same time frame has increased 5.7 % annually. Now, elementary school arithmetic tells me that 5.7 divided by 2.9 = 2. Therefore, for every dollar in increased taxes, there must be two dollars in reduced spending. That’s the only way to start pulling back from the cliff. In five minutes, I have gotten the right formula, while Washington in five weeks has not gotten it right. Going back to bed! I am beginning to get some grasp on the philosophy that is permeating America. Absolute truths and God’s code for moral conduct are being discarded under the premise that the greater good of the culture trumps these things. In other words, relative truths or untruths, and relative morality or amorality, which are means to promote ends that will satisfy 21st century cultural trends, are lords. Absolute truths and God’s code for moral conduct are seen as hindrances towards these ends. You are wrong if you espouse to this. What seems now, if it’s based on relativisms and untruths, will come back to bite you. Anarchy, every man doing what seems right in his own eyes, and many amoral compasses, pointing in many directions will only breed darkness into ever increasing darkness. Society must be founded on the bedrock of the absolute truths of God and His moral compass for humanity. As I always say. Socialism is always advocated to the masses by high falooting free market capitalists who know that socialism will never work for them. Better said, they don’t want it to work, knowing that the luxuries of free market enterprise are far better. Yet their socialistic philosophies, which are a means to control the masses, are promoted and swallowed by many, while they secretly continue in their capitalistic free market ways. The utopic pendulum of socialism swings far and wide until those under it appreciate that they were not supposed to be there in the first place, and that free market enterprise is always better, with all of its imperfections. The more that I grow in my faith, the less I try to convince or bring people to my way of thinking. The less I try to impress man or fix him or her. I have to fix myself first. This is my ultimate responsibility. I have my dance to dance with the Lord Jesus and I believe that it’s a glorious eternal dance. If some see me dancing, and like the dance I dance, I am ecstatic, because I feel that mine is the best dance. If they don’t, and like their dance instead, I respect that, still hoping that they will come around to dance the dance I am dancing. But I won’t run after them. My dance keeps me very busy. Every man and woman is dancing to some tune and that tune will take them eternally somewhere. My prayer is that every man and woman chooses the right and not the incorrect dance and ends up in the wrong dance hall which they will come to regret. The terrible violence that the children endured at the hands of this crazed kid, is no difference to the violence that the unborn children endure at the hands of the abortionist. Really, there is no difference, yet we are abhorred with one and accept the other. This shows the fragmented dysfunctionality of our society without God. Period. I would love to see a two hour Good Morning America special dedicated to the plight of the unborn. I was at a wonderful retreat for five days with my Catholic brethren, and had very small information about the mass murder of these precious children. This morning as I waited for my coffee to brew, I saw the faces of the precious ones flash before me on Good Morning America. My thought was this. As long as we sanction the mass murder of the unborn kids, the mass murder of the born ones will not be resolved, no matter what amount of gun control we do. If human life cannot be respected when it cannot be seen, neither will it be respected when it can. If the President weeps for the slain born ones, but does not for the slain unborn ones, his tears do not affect very very much. Americans are the most capitalistic, free enterprised people on the planet. Our gluttony for the consumption of material goods and comfort is unsurpassed. Yet we want a socialistic society, where everyone is treated benevolently equal, while still protecting our capitalism. How can that be accomplished? Well, supposedly by crucifying the wealthy, while we poorer folk do nothing towards our socialistic expectations. Let me tell you, it won’t work! If you are going to promote a cause you must be fully invested in it. You can’t be a socialist on the backs of the wealthy while a capitalist on your own. The witness or evidence that John was to give through his body was the life of Jesus Christ being lived out In His preexistent nature as fully God with the Father before coming to earth as man. When Jesus said it is finished, this means I can also come to give this evidence through my body, because the work of Jesus to allow me to do this, is done. The life of a Christian should be progressing to the place where the testimony of Christ in His preexistent nature and its glories are manifested through him or her. Once again, I can’t think of any other religious river that affords this sublime way of life to a mere mortal. Many today criticize Christianity by saying, that its only one of many ways. I won’t debate it. I care not to and don’t have time for it. My encouragements to all who question is compare for yourself the ways out there, in light of what I wrote. Ac 4:33 And with great power gave the apostles witness of the resurrection of the Lord Jesus: and great grace was upon them all. My life’s ultimate purpose is to give factual evidence of the resurrected Christ in me, the One who lives in His eternal pre incarnate state. Christ lives in me in glory. Glory is displayed as God’s dominating power to dominate all evil, functioning through me. Once I come to be aware that Christ has completed His work and nothing else is left to be done in me, then I become a vessel of witness of the resurrected Christ, because there is nothing left to be done in me, except to be that witness. My faith then is not in me but to continually believe in the One who has resurrected and conquered all. This is when faith becomes easy. I can’t prove the existence of an invisible God to others but I can surely prove Him to myself. For 34 years God speaks to me and in me as normally and as tangibly as any one comments to me on Face Book. He candidly speaks to me about anything and everything. I long for everyone to see this, but at the end of the day I must be sure that I am first answering to myself before God. Religious debate and arguments about what is invisible are for the most part a waste of everyone’s time. I, like Mother Theresa, says, “come and see”. If God can tangibly speak to me, He will to you. The key though is not to come with a clenched debative fist shot up to heaven but in reverential respect and humility. God will talk to the humble, but does not specifically talk to the arrogant, though He does at times. The greatest legacy I can give to myself, my family, friends and foes is to be the fully actualized individual whom Christ in me, manifests through me. Christ as a historical figure is the Individual Par Excellence. He is the greatest progressive, but His progressiveness is fully rooted in God and His Word. He is the greatest conservative, but His conservatism is fully rooted in God and His Word. He is the greatest radical, but His radicalism is fully rooted in God and His Word. He is the corporal disclosure of the Invisible God. Thus Christ is the world’s greatest and most individual, individual, and calls those whom profess Him to be the world’s greatest individuals, in the facets of His individuality realized through every individual person. If one who professes Christ feels smugly satisfied to be simply part of the Christian crowd, he has missed a great part of his purpose on this earth. At the suggestion of my Catholic friends, whom I met in the retreat, I purchased myself Jesuit theologian Karl Rahner’s epic work, Foundations of Christian Faith. It’s my understanding that Rahner’s work influenced the penning of Vatican Two. The readings are slow, but highly important to an understanding of what man is in context of what Christ did. Rahner states that freedom in Christ is simply not to be looked at as sequestered concepts such being free from drugs, or fear, or lust. Freedom in Christ is also to be perceived as the freedom which Christ gives to man so that he may transcend and be all that Christ did for him by the blood of His cross. This transcending occurs right now, since God, as the great I Am, functions in the very now. The eternal life that we take a hold of, is not just a power grab of isolated blessings that we need for our happiness, like money, or health, or a new job, but an enjoyment of the continuum of the life of Christ which constantly flows from the Christ within us. The Christian life is a now participation of that eternal life from moment to moment. The ability to transcend by faith and be filled with all the attributes of whom Christ is, to take hold of eternal life now, to exist as an infinite creature now, and to transcend the love of this word, and to be metamorphosed into a supernatural creäture obeying supernatural laws and a living supernatural life just as God does, in the now, is all part of freedom in Christ which is accessible now. Finally, we are to reckon not just what we need from day to day in Christ as an isolated creation of God, but to also see ourselves in the ocean of God’s comprehensive eternal plans. The Christian is simply not a microcosm of one person whom God loves, but part of the glorious church who has an eternal and timeless purpose. The Christian cannot say I am rich, or I am depressed, or I am happy or I am sad. The I am in the Christian is not a conglomeration of things which affect him. The I am in the Christian, is a person, Christ, the great I am. Christ as the I am is not attached or bound to anything in this world. So the Christian in his being is not attached to anything. He is simply the manifestation of the I who is Christ. He lives independently of anything in this world. His existence is a now continuum of the life Christ in Him and is free from all things. He is only attached to Christ and His life. 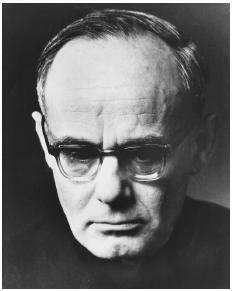 “Who Am I” According to Theologian Karl Rahner. Col 3:11 where there is not Greek and Jew, circumcision and uncircumcision, foreigner, Scythian, servant, freeman — but the all and in all — Christ. These are the thoughts of the Jesuit theologian, Karl Rahner. Who is man, by that I mean, mankind? The reality of who man is, has been fragmented in part, with the unrealities which Rahner calls empirical anthropologies, or the study of man by different disciplines. Science, medicine, history, or geography helps to explain who man is according to their discipline. Rahner says that the explanation given by these disciplines is not totally unreal, there are only partially correct. The reality of who man is, is not only attempted to be explained through these disciplines but also through the cumulative experiences of past memories, ideas, opinions, experiences and events, now locked in the mind of man which have shaped his reality. Many of these realities are unreal to what is actually happening in the world and is only real to the man who has them locked within his emotions and thoughts, and is captive to them. Reality, or who am I, for Rahner, is not anthropological disciplines or a host of experiences which shaped the man’s unreal realities, but the Person of Christ who actualizes the transcendence, the wholeness of man back before he was marred by the inception of sin, and his infiniteness. For the man who has allowed Christ in his heart, the who am I, is not a conglomeration of cumulative experiences or fragmented anthropological disciplines. The who am I, is now a Person, that is the Person of Christ Jesus who is not fragmented and does not need any anthropological disciplines to explain Him. He is the I am who I am. Christ is the total of the attributes of the invisible God made corporeal or visible to the human. The I, who is Christ, is absolutely individualistic from person to person, and calls every person to be purely individual. In other words, because Christ, the I in the person, is an individual and not a conglomeration of things, every person is called to be purely the individual through whom Christ, the individual , manifests His undisputed and transcendental individuality as He wills. This is why we are not called to follow the masses hypnotized by entertainment or media, but to be the actualized individual whom Christ has made us and manifests Him as the supreme individual, the Great I Am and the who am I, in me. The dichotomy of the Christian life is that this utter individuality can only be manifested by utter dependency on The One who manifests Christ, as that perfect, transcendental and infinite individual, and who is the I, and the who am I, in man. And if I may add to what this great theologian wrote. The variation between Christianity and other religions is that Christianity is a Person and not creeds, as are the other. Christ, being Christianity, is the image of the invisible God made visible. In that Christ is the image, He manifests the identity of God, and who God is in that image. For the Christian, his goal must not be to delve in cultural or social rights, but one of revealing true identity. His resolution is to reveal the new identity of God in Christ, by the display of a new humanity, or as Paul calls it, the new man, Christ Jesus, which lives inside of the Christian. The world suffers from a massive predicament of misplaced identities. Every time that a person says, I am this, or I am that, what he says is founded upon a broken humanity, or as Paul calls it, the old man. Thus we have a problem of misplaced identities. The Christian must arise above the fray of social issues, culture wars, or socio economic rights, for it is all feeding this broken humanity. The Christian must become emancipated and manifest a new humanity, with its unfragmented identity, that of God’s, to a dying world which screams to find itself but all within this broken humanity of misplaced identities. Ultimately, everyone is trying to find God and satisfy what psychologists would call, the child within. The Christian’s role is to display a new humanity and a whole identity that people can witness and come to, who is Christ Jesus, in the Christian. Whenever God speaks, there is the birth of a new cosmic order. God did not command creation by the imperative, or a mere simple command, but rather, the jussive. The jussive describes a command coming out of a strong personal desire or wish, in the heart. When you command something in the Name of Jesus, see to it that it comes out of a desire that it’s in your heart, birthed by God’s Spirit. If it is, it will very much more happen, than a simple disconnected command given during prayer time. Look at nine instances of the jussive in the Genesis creation account. This is vastly important in a miracle ministry. This is why I say that the juice for miracles is in the jussive. 3 And God said, Let there ( jussive active ) be light: and there was light. 6 And God said, Let there be ( jussive active) a firmament in the midst of the waters, and let it divide the waters from the waters. 9 And God said, Let the waters under the heaven be gathered together ( jussive passive) unto one place, and let the dry land appear ( jussive passive): and it was so. 11 And God said, Let the earth bring forth ( jussive causative) grass, the herb yielding seed, and the fruit tree yielding fruit after his kind, whose seed is in itself, upon the earth: and it was so. 22 And God blessed them, saying, Be fruitful, and multiply, and fill the waters in the seas, and let fowl multiply (jussive active) in the earth. 24 And God said, Let the earth bring forth ( jussive causative) the living creature after his kind, cattle, and creeping thing, and beast of the earth after his kind: and it was so. 29 And God said, Behold, I have given you every herb bearing seed, which is upon the face of all the earth, and every tree, in the which is the fruit of a tree yielding seed; to you it shall be (jussive active) for meat.